[email protected] is now whimpering to all that he did the famous “hair show” with me (where he seriously messed up my hair), & that he would have now done it differently because it is said to have “humanized” me-he is taking heat. He called & said “monster ratings.” Be a man Jimmy! I just wanted to know if there’s something we could do that’s not presidential. something that we could do now that we’re both just civilians. … Can I mess up your hair? He proceeded and messed up Trump's hair, and the end result was a massive bedhead. Watch Fallon mess Trump's hair. Recently, Fallon shared that he was depressed because of all the criticisms he gained for normalizing and humanizing Trump despite his comments on Muslims and Mexicans at the time. 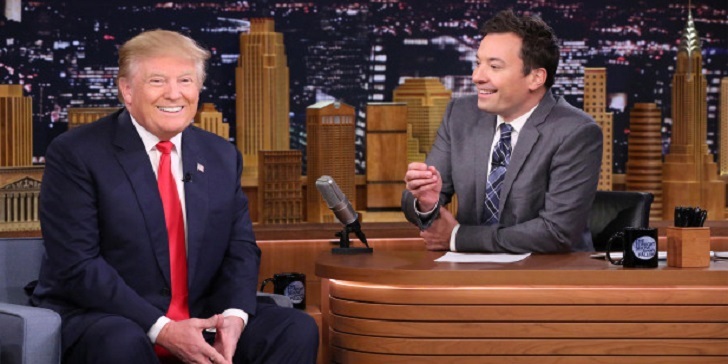 Donald was not having it with Fallon and went on to Twitter to attack the TV host. Fallon, on the other hand, also did not stay quiet as he also went on to Twitter to make a very sarcastic post. RAICES stands for Refugee and Immigrant Center for Education and Legal Services which works to assist with family reunification.